3.5	stars -	"Review for Walden Mini Mega Magic SLX" Mark Taylor This Walden Mini Mega Magic SLX is the best Fish Funboards I have tried. 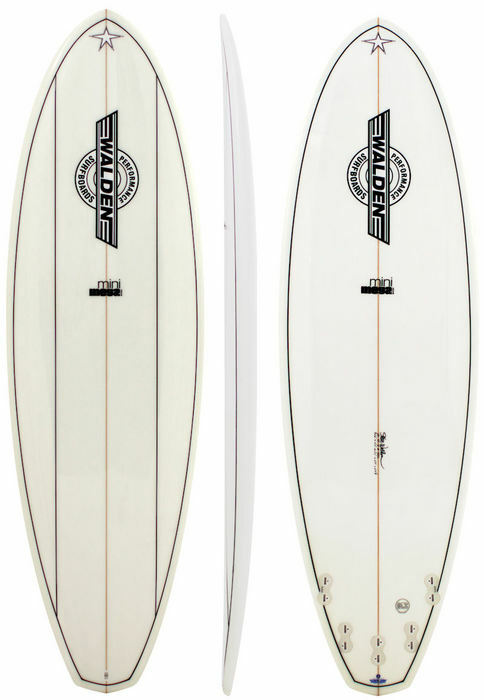 The Mini Mega Magic is essentially a high volume version of Walden's popular performance longboard in a compact design. The length-to-volume ratio is the key element that delivers significant performance advantages over other surfboards in its class. The outline is geared for performance surfing; the nose and tail have been pulled in to allow the board to fit into more critical parts of the wave and turn in a tighter radius. The unique step rail on the deck combined with a hard edge and a beveled vee on the bottom strike a balance between bite and forgiveness when the board is set on rail. The Mini Mega Magic is ideal for surfers looking to maintain the volume of a much longer board yet want the manoeuvrability and freedom to explore parts of the wave usually reserved for shortboards and hybrid models.